While U.S. Secretary of Education Arne Duncan seems to be escalating the lies and half-truths that have characterized his work since he was Chief Executive Officer of Chicago's public schools, for several months people across the USA have been taking a closer look at Duncan's claims and talking points (and even the version of his own history that he's been trying to peddle) and finding that much of what Duncan says is bunk. 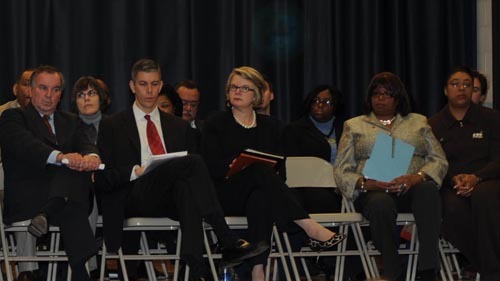 Future U.S. Secretary of Education Arne Duncan (above, second from left) shared the stage on December 11, 2008, promoting Chicago's merit pay with then U.S. Secretary of Education Margaret Spellings (third from left), Mayor Richard M. Daley (left), then Chicago Teachers Union President Marilyn Stewart, who supported all of Duncan's merit pay and other teacher firing programs ("Fresh Start"), and alderman Latasha Thomas (right). Substance photo by George N. Schmidt.The latest is a refutation published by a Harvard University scholar, noteworthy because Duncan's alma mater (Harvard) has produced more apologists for Duncan's policies that critics — at least so far. U.S. schools aren't really falling behind says Berkeley professor and Harvard scholar Vivek Wadhwa, who took a closer look at Duncan's claims about the PISA. So says (not in those words, of course) Vivek Wadhwa, a visiting scholar at University of California-Berkeley, senior research associate at Harvard Law School, and director of research at the Center for Entrepreneurship and Research Commercialization at Duke University. And he says it in, of all places, Bloomberg Business Week, which seems of late to be taking notice of many of the scams that have cost the USA dearly of late. America has an inferiority complex about its education system. You hear the sirens every year, when the OECD Program for International Student Assessment (PISA) releases its annual test results. Finland, South Korea, and Singapore usually come out on top; we start blaming our K-12 teachers for not teaching enough mathematics and science; we begin worrying about the millions of engineers and scientists China and India graduate. This year the big surprise was that Shanghai garnered first place in the PISA rankings. Then The Wall Street Journal ran a story on the home page of its website titled "Why Chinese Mothers Are Superior." The Journal article claimed that Chinese (and Korean, Indian, etc.) parents raise "stereotypically successful kids"—math whizzes and music prodigies. They do this by not allowing their children to attend sleepovers; have a playdate; be in a school play; complain about not being in a school play; watch TV or play computer games; choose their own extracurricular activities; get any grade less than an A; not be the No. 1 student in every subject except gym and drama. The article went on to recount as typical a series of acts that would be considered child abuse in the U.S. (and aren't the norm in India and China). The Journal article was simply bizarre, yet it is true that education in China and India is very challenging and fiercely competitive. Children are brought up to believe that education is everything, that it will make the difference between success and starvation. So from their early years they work long and hard. Most of their childhood is spent memorizing books on advanced subjects. Meanwhile, the perception is that American children live a relatively easy life and coast their way through school. They don't do any more homework than they have to; they spend an extraordinary amount of time playing games, socializing on the Internet, text-messaging each other; they work part time to pay for their schooling and social habits. And they party. A lot. These stereotypes worry many Americans. They believe the American education system puts the country at a great disadvantage. But this is far from true. My research team at Duke looked in depth at the engineering education of China and India. We documented that these countries now graduate four to seven times as many engineers as does the U.S.The quality of these engineers, however, is so poor that most are not fit to work as engineers; their system of rote learning handicaps those who do get jobs, so it takes two to three years for them to achieve the same productivity as fresh American graduates.As a result, significant proportions of China's engineering graduates end up working on factory floors and Indian industry has to spend large sums of money retraining its employees. After four or five years in the workforce, Indians do become innovative and produce, overall, at the same quality as Americans, but they lose a valuable two to three years in their retraining. And then there is the matter of the PISA rankings that supposedly show the U.S. trailing the rest of the world. Hal Salzman, a professor at Rutgers' John J. Heidrich Center for Workforce Development, debunked myths about these in a May 2008 article in Nature magazine. Salzman noted that international tests use different sampling criteria from country to country, so we're not always comparing apples to apples. As well, the tests compare select populations of small countries such as Singapore and Finland, which each have about 5 million people, with the U.S., which has 310 million. These countries achieve the top rankings on the PISA list. Compare these countries to similar-sized U.S. states, however, and you find that some of those states, including Massachusetts (population 6.5 million), produce the top students. Additionally, we're comparing America's diverse population—which includes disadvantaged minorities and unskilled immigrants with little education—with the homogeneous populations of countries like Finland, Japan, and New Zealand. Much is made of the PISA test scores and rankings, but the international differences are actually quite small. Most of the U.S. ranking lags are not even statistically significant. The U.S. falls in the second rank on some measures and into the first on others. It produces more highest-performing students in science and reading than any other country does; in mathematics, it is second only to Japan. Moreover, one has to ask what the test results actually mean in the real world. Do high PISA rankings make students more likely to invent the next iPad? Google (GOOG)? I don't think so. Wadhwa is a visiting scholar at University of California-Berkeley, senior research associate at Harvard Law School, and director of research at the Center for Entrepreneurship and Research Commercialization at Duke University. Follow him on twitter—@vwadhwa .